Kurukku kalan / kalan is an important dish for sadya menu. ‘Kurukku’ literally means concentrating. Here yogurt is concentrated to make this dish. Sadya is a traditional feast in my home state Kerala, where an array of exquisite vegetarian dishes, which differs in looks and taste from one another. It is served on a banana leaf and dishes are arranged and eaten in a particular order. Even though there are some regional differences in sadya menu, still it is cooked and served in same fashion for many years and perhaps for many more years to come. It is like our Thanksgiving turkey dinner which will be same as every year only people changes, the traditional dishes will remain. In Thiruvanthapuram region, from where I am, Kalan or pulissery is the main item in sadya, where as in Thrissur from my hubby’s place kurukku kalan is replaced by kalan or pulissery. Preparation of kalan and kurukku kalan differs slightly. First one is gravy whereas is like a thick curry. 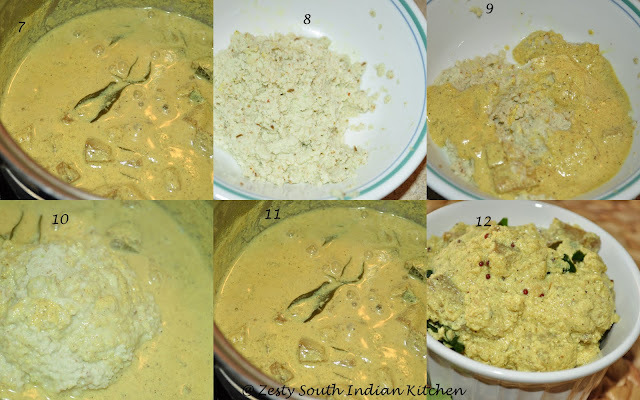 I was planning to make kalan for some time, then last week one of the readers of this blog ” SN” asked me about the recipe of kurukku kalan to me. I thought why wait I need to make and post it immediately. 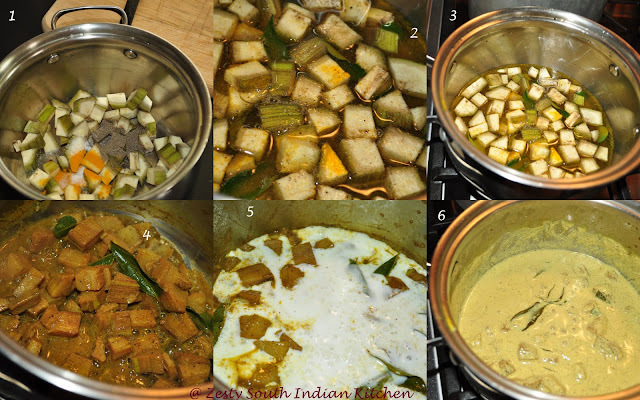 If you are a fan of sour taste you are going to love this curry. My hubby likes to have anything contain with a little bit sour taste. He like yogurt that is slightly sour, the store bought yogurt doesn’t have the kick what he want, so we make homemade yogurt, he had bought a yogurt maker even before our marriage. Kurukku kalan contains vegetables like raw banana and Yam/Chena/Suran. The second one is available only in frozen form in Indian store; I don’t like them as it will be like ice rock, and doesn’t have any flavor, so I stopped buying them. We use Monthan kaya/ a type of raw green banana to make curries, last week on grocery shopping I spotted them in Fiesta and bought them. They are not good as ripe ones only good for making curries. I used one raw green banana for this kurukku kalan and rest for making Mezhukkupuratti. I used recipe from this YouTube video and scaled it down to 4 serving. Wash and peel the skin of banana and chopped into cubes and set aside. In a sauce pot add banana pieces, turmeric powder , black pepper, ¼ teaspoon salt, 1 sprig of curry leaves and 2 cup of water and cook them for about 25 minutes or until the entire water is absorbed and banana pieces get cooked well with all flavors. To this add slightly beaten yogurt with ¼ cup of water and reduce the flame and cook again until almost yogurt gets thickened. it takes about 30 minutes, stir in between to prevent yogurt from cuddling. In the mean time grind coconut with green chili and cumin seeds into fine paste with ¼ cup of water and set aside. Add a ladle full of yogurt gravy into the ground coconut chili cumin paste and mix well. Add this mixture to yogurt gravy in the sauce pan and cook for another 2 minutes. In small pan add 1 teaspoon coconut oil and mustard seeds and curry leaves when mustard starts popping add fenugreek powder and switch off the flame. Transfer everything to yogurt banana coconut mixture and mix well to incorporate. Enjoy with hot rice as much as you wish. Omg, wat a droolworthy kurukku kalan, looks soooo creamy and yummy.. Thanks for showing us step by step how to prepare this kalan. Looks awesome. looks yummy n goes grt with dosa..
Swathi the is very inviting and healthy.I love step by step explanation.Next time i will try this recipe. looks tempting swathi..My family favannu ithu..atleast once in a week njan ithu undakum..YUM!! That looks so interesting and sounds delicious! creamy and delicious.. great recipe.. Thanks for sharing it. This is such a great looking recipe! Love the step-by-step photos! thanks for sharing lovely! happy thanksgiving to you and your family! ready for black friday yet? I know exactly what to do with the raw bananas now. Thanks for sharing this delicious recipe 🙂 Bookmarked! Loved this version,looks so yumm! I love anything with yogurt and add in coconut – I’ll be one happy girl! This looks delicious. What a fantastic curry! The flavors in it are fantastic — the banana, coconut, and spices sound wonderful together! This is very interesting. It seems that I am going to enjoy making this recipe.